What is the relationship between atopy and contact sensitisation? 2) atopy mainly defined by history (subject's and researcher's bias). Jones et al. 1973: "Allergic contact sensitivity to the poison ivy-oak family is infrequent in patients with atopic dermatitis" Rudzki et al. 1984: "Atopic disease is distinctly more frequent in nickel-sensitive subjects" Cronin et al. 1970: "Atopics are no more likely to develop an allergic contact dermatitis than patients with other types of endogenous eczema such as seborrheic or nummular eczema"
Rudzki and Grzywa 1975: "Patch test in atopics is less frequently positive than in all patients with dermatitis" Dotterud and Falk 1995: "Positive patch tests were significantly more frequent in atopic than in non-atopic children" Nielsen and Menne 1996: "Contact sensitization is independent of enhanced IgE response"
de Groot 1990: "Adult atopics seen in dermatological practice who present with dermatitis are less frequently contact sensitized than such patients who are non-atopic" Manzini et al. 1998: "Atopy represents a predisposing factor for contact hypersensitivity" Mortz et al. 2002: "No association was found between contact allergy and atopic dermatitis or inhalant allergy"
5 vocational schools - in each 1 random class; in total 135 students - 73 females and 62 males, 18-19 years old. Figure 3. 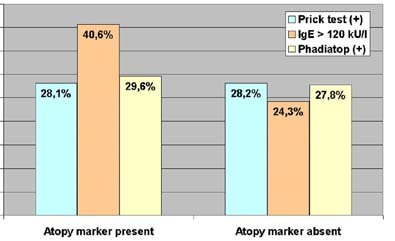 Atopy markers in patch test-positive versus -negative persons. Figure 4. 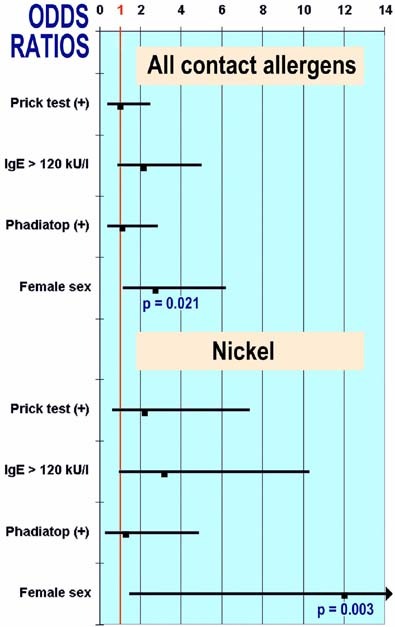 Atopy markers in nickel-positive versus -negative persons. In the general population, there is no (or negligible) correlation between atopy and contact sensitisation. 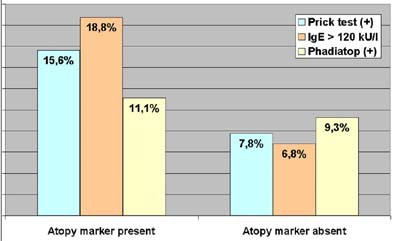 Comment: Previously, only one study was carried out with the use of objective atopy markers (prick test and IgE). The study population included random residents of Copenhagen County. 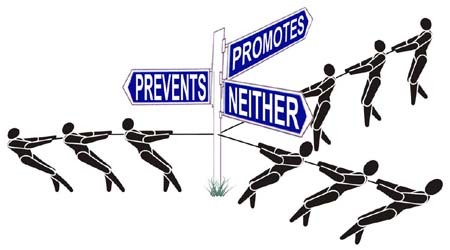 The conclusion was "Contact sensitisation is independent of enhanced IgE response" (Nielsen and Menne 1996), which is in line with the above results. Figure 5. Relationship between atopy markers and contact sensitisation. financed by the Polish State Committee for Scientific Research (Grant No. 6 P05D 028 20).